In the marine field since 1918 Twin Disc Incorporated, an international manufacturer of power transmission equipment, has been the first Marine Company believing in the concept of “TOTAL SOLUTION SUPPLIER”. Worldwide known as manufacturer of marine gears, in 1992 Twin Disc Inc added to his range of products the Arneson Surface Drives. ASD, the first and fastest articulated surface drive system released to the market in 1980, has been a real breakthrough in marine propulsion field and it’s become the “name” for such innovative mean of propulsion system. Power commander, an electronic control for marine application, has been developed by Twin Disc Electronic a company part of the Twin Disc group. Total propulsion control with electronic precision are obtained with Power Commander available for all mean of propulsion systems and ready to interface with all popular electronic engines and transmissions. General trend is to believe in one technology, whether conventional underwater propeller or surface drives or water jets systems. Twin Disc is the only Company which can today offer the best solution for each individual application as well as combined systems and customized electronic controls in few words: a TOTAL SOLUTION SUPPLIER. 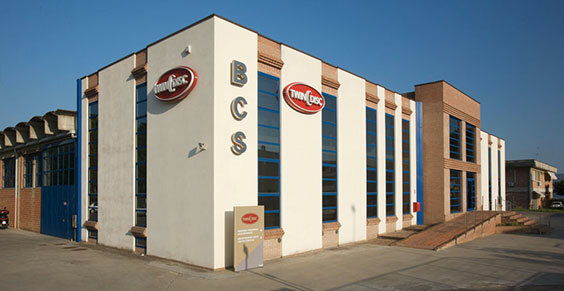 BCS is acquired by Twin Disc Inc.
Over 50 years of experience and professionalism brought BCS srl to the top of production and worldwide distribution of high quality boat equipment and management systems. A knowledgeable, expert and highly motivated team to support customers in every phase of the boat design. This is Twin Disc European Marine Propulsion Group part of Twin Disc Inc.
European Marine Propulsion Group is responsible for Twin Disc Propulsion Products, Arneson Surface Drives, Twin Disc water jets and Electronic controls, for the European, Middle Eastern and African markets. Company engineers work hand in hand with boat builders and engine manufacturers to design, or to adapt existing products with characteristics unique to their specific applications. Twin Disc EPG supplies the commercial, pleasure craft and military segments of the marine market with transmissions, surface and water jet drives and electronic controls. All sales and marketing activities (including engineering support) as well as after sales and service throughout its markets of competence are coordinated by EPG. An highly professional Sales & Service network has been established and new distributors/service centers will be appointed soon with the aim to always improve Twin Disc customers satisfaction. Direct contact with the boat builders at design phase, cooperation with the major propeller manufacturers and Engine OEM’s to supply “TURN KEY PACKAGES”. This has always been EPG approach to the market, the only way we consider valid to obtain successful results.